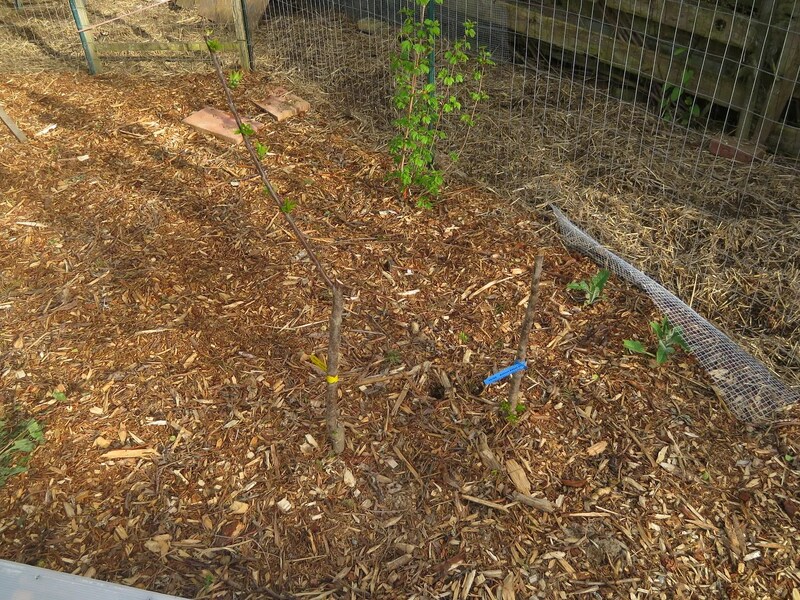 A few of the trees are traditional espalier trees, that I grew from one year-old “whips” (basically a skinny little stick on roots). 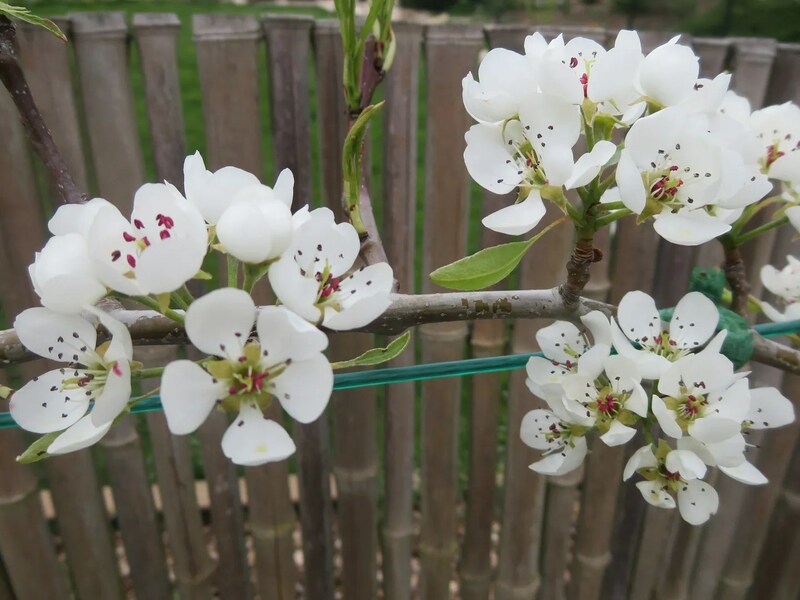 One of my espalier pears is blooming this year for the first time. 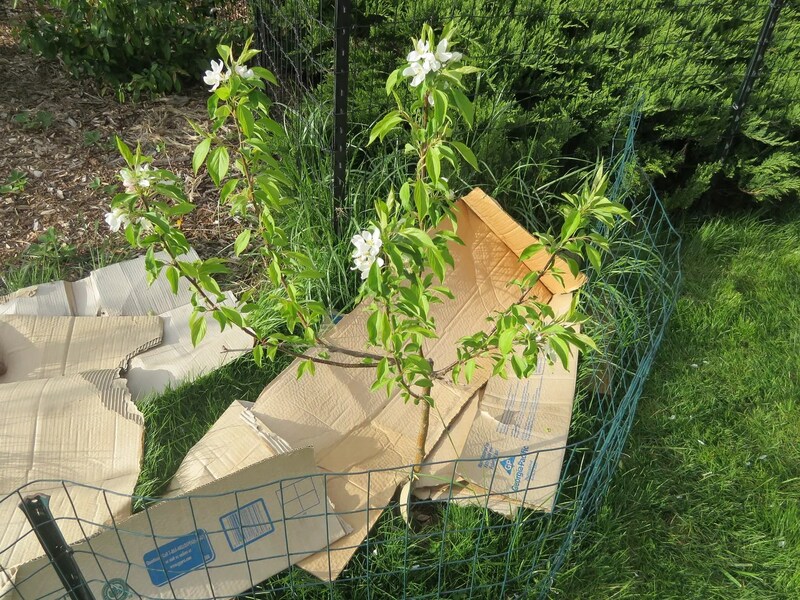 It’s four years old, and I’m hoping for fruit, even though its pollination pear is not blooming this year (it’s a year younger). Maybe a neighbor has a pear I don’t know about? I can hope, right? 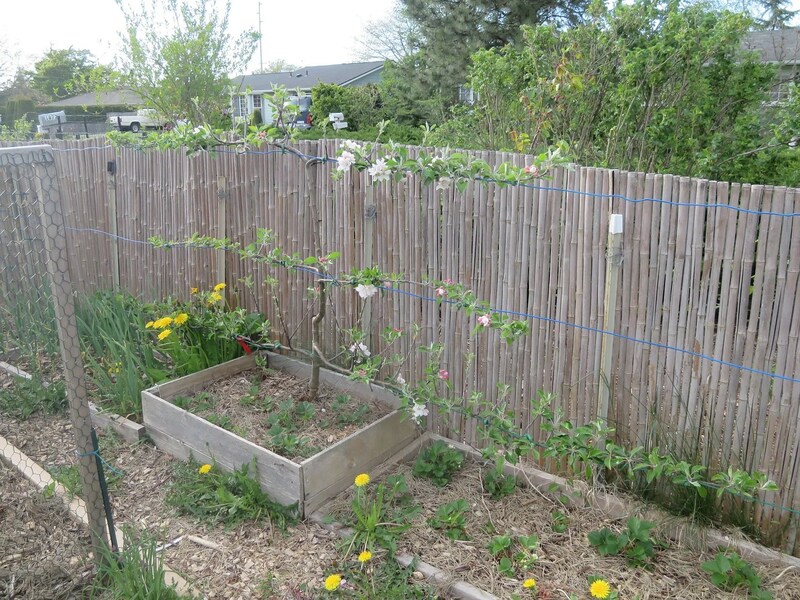 My four year old espalier apple is also blooming. 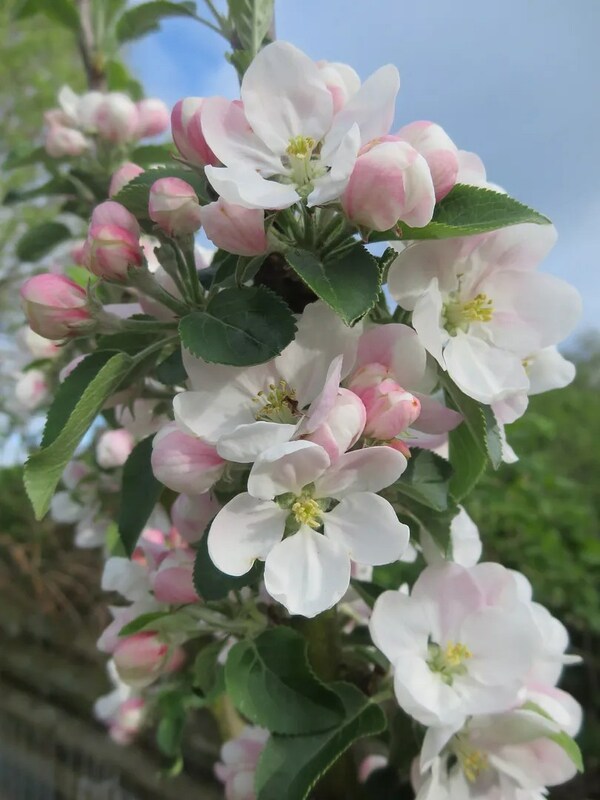 Apple blossoms are so pretty. 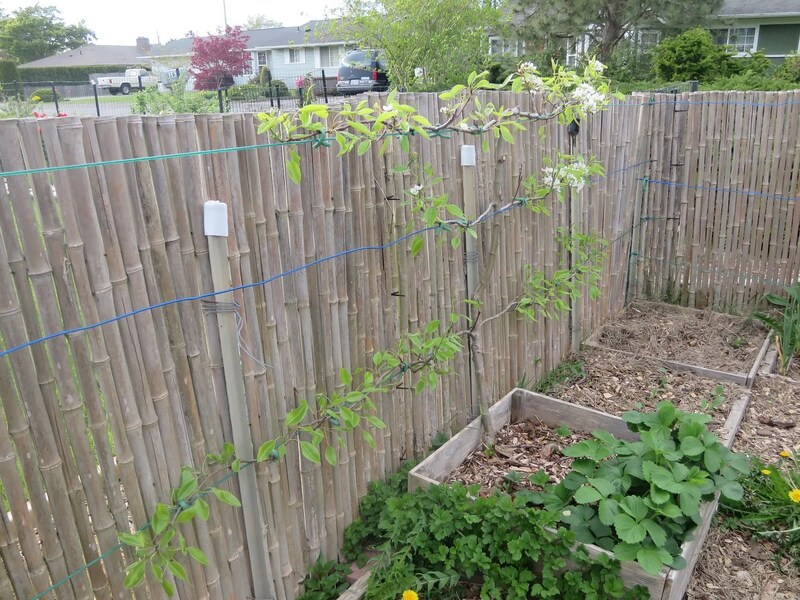 I like the art of espalier, even though I’ll probably get more fruit from the “little tree” method. Supposedly, about 100 apples per tree. Given that I currently have seven apple trees, that is a very nice number! 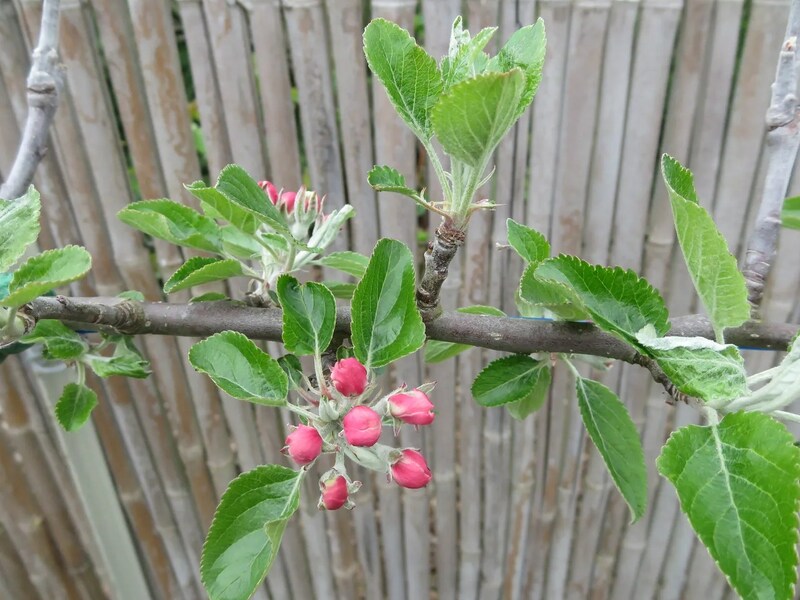 I also have a couple of columnar apples, which are really taking off, and looking quite gorgeous. I could be pruning them into more of an exacting columnar shape, but I rather like the extra branches. 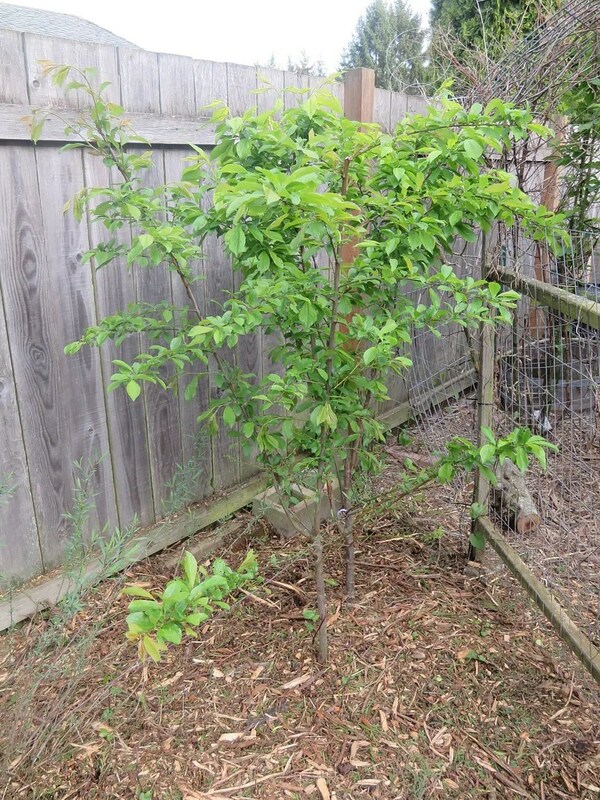 All of the “little trees” were planted last year, and although I chopped their little trunks off even with my knee immediately after planting them, they have grown immensely. 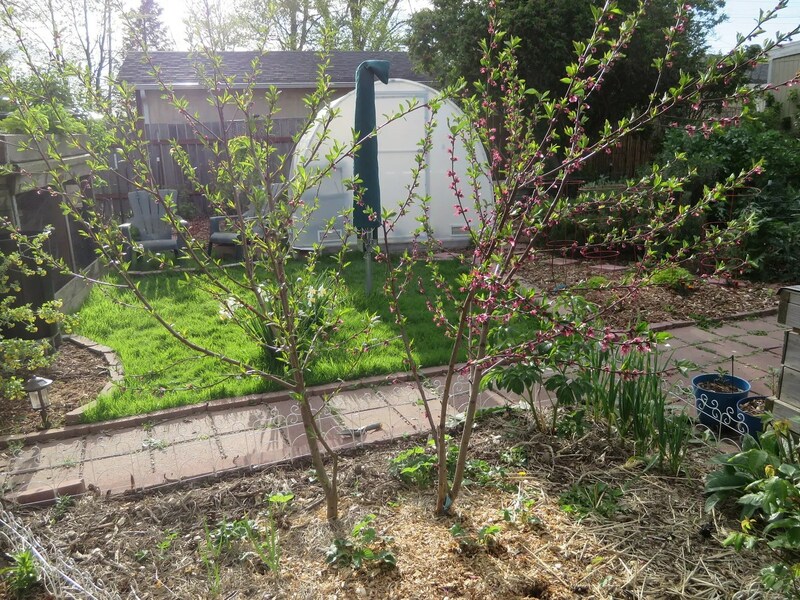 I have two peaches, both planted together only about a foot apart. This distance helps keep them small, and of course is great for pollination. 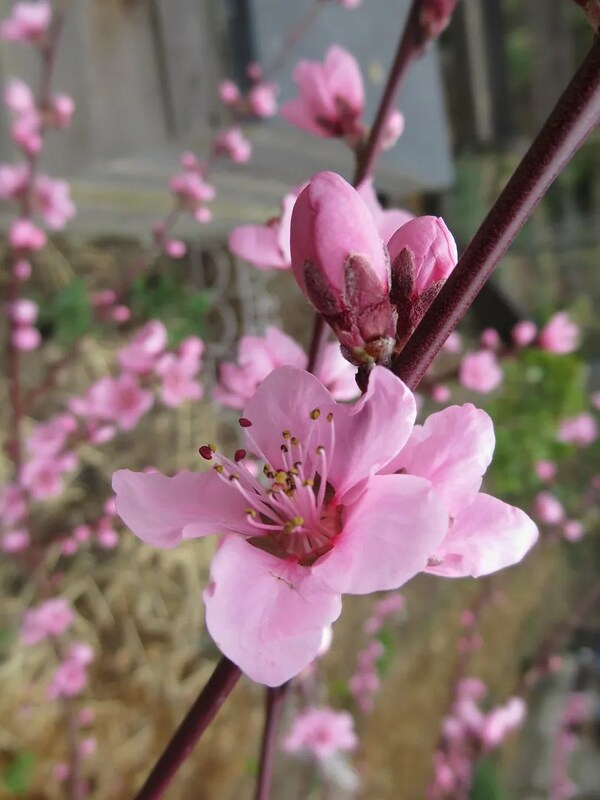 Both peaches bloomed this year, so I’m hoping for a few actual peaches! One of the trees was covered in the brightest pink blossoms possible. I can’t believe I didn’t get a picture of the entire tree in bloom, but here’s a close up the flowers. I have four plums, and am planning to add a couple more next year. Two of them produced a handful of flowers, so probably next year I’ll see fruit. 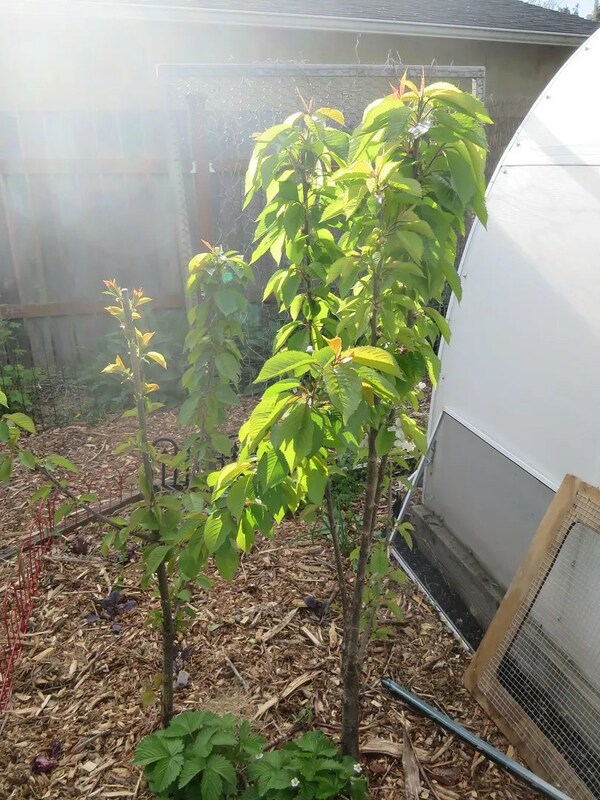 Last year, I planted two sweet cherries. And this year, two sour cherries. These are hard to see, because they haven’t leafed out yet, and are just sticks in the ground, cut off at knee level. Can you see them? Look for the blue and yellow tags! 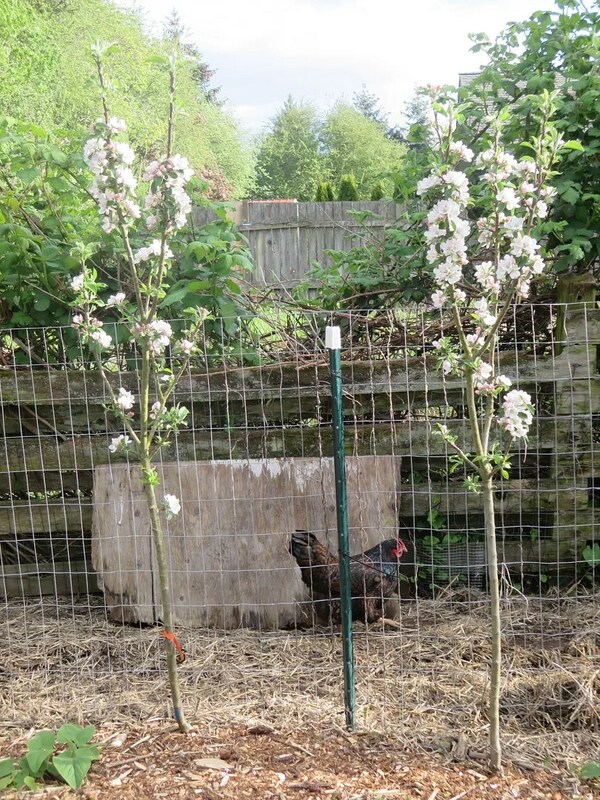 Planted last year, it astonished me by producing exactly one little apple. This year, it’s blooming quite well, and I expect to get several more. See how perfectly adorable it is? And see how many branches it’s grown in one year? I love this method. Basically, I will always keep these trees small enough to reach all the branches while standing with both feet on the ground. No ladders, no picking hooks. I could not recommend Ann Ralph’s book any higher!